Released in 1989 in its home country of Italy as Terminator 2 (two years before an actual sequel was even made), Shocking Dark is a fascinating snapshot of a group of filmmakers and actors who seemed to believe that they could blatantly rip off other movies by recreating entire scenes using similar plotlines, characters, and dialogue, but without anybody noticing. Complete with marines, Ripley and Newt type characters, an android, loads of firepower, tracking devices, monsters on the loose, and time travel, it’s breathtakingly absurd how many elements from Alien, Aliens, and The Terminator are made use of, but with obviously subpar results. 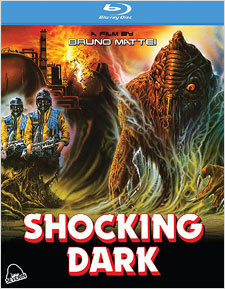 It’s also not that “shocking” to me that Shocking Dark never made its way to the U.S. until now. It deliberately steals so much that it almost feels like an Italian “sweded” version of those same movies, or even a Bollywood version that’s missing the musical numbers. It really should have been called “Schlocking Dark” for how terrible it is. There’s a cheese factor to it with over-the-top, and sometimes questionable, performances from its cast, but it’s not as thoroughly entertaining as one might hope. The novelty of its laziness begins to wear off after a while, leaving you wanting more in the end than what you actually get. Today, Shocking Dark (also known as Contaminator, Alienators, and Aliens 2 in various parts of the world) is more of an interesting lost treasure than it is a good film. Cheap sets hampered by poor performances and lazy scriptwriting all combine to make a movie that’s jaw-droppingly awful, but at the same time, entertaining enough for a well-lit crowd on a Saturday night. In hindsight, it’s actually a shame that it wasn’t ever released on VHS in the U.S. as it likely would have made a splash in rentals. Severin Films debuts Shocking Dark for the first time on home video in any format, in this case Blu-ray, in a nice, concise package. According to the back cover, the presentation of the film has been “scanned in 2K from the Director’s Cut negative [that was] discovered in a Rome lab vault.” It’s a solid presentation with excellent grain that’s not thoroughly even, but never distracting as it fits the aesthetic of its source. There’s also some nice color reproduction with multiple splashes of green, red, pink, and blue, with decent skin tones and black levels. Everything appears bright, clear, and stable, with only scratches and speckling leftover, which is more apparent during the opening titles. For the audio, an English 2.0 mono DTS-HD track is available, as are Italian, Spanish, German, and Mandarin 2.0 mono Dolby Digital tracks. The English track sounds like it’s been pieced together from a couple of different sources, although that’s just speculation on my part. It actually comes through well with few complaints. Dialogue is mostly clear and discernible, but some hiss and crackle are leftover, which is more prevalent in certain areas than others. Optional subtitles in English SDH are also included. Extras include Terminator in Venice, a 13-minute interview with director Claudio Fragasso and co-screenwriter Rossella Drudi, who appear to not like the movie all that much in retrospect (can’t imagine why); Once Upon a Time in Italy, a 13-minute interview with actress Geretta Geretta, who speaks about her career and her experiences working with Bruno Mattei, as well as her earlier work in Demons; alternate Italian opening titles (with the Terminator 2 title attached to them); and a low resolution Japanese trailer for the film under the title Alienators. And if you were lucky enough to order this from Severin Films’ website, there was also the option of a limited Terminator 2 slipcover (limited for obvious reasons). Severin Films’ one, two, three punch of Zombie 3, Zombie 4, and Shocking Dark has managed to give fans, old and new, a few more titles to add to their Italian horror shelves that would make for an entertaining triple feature with a few beers and pizzas in tow. Shocking Dark on Blu-ray is particularly welcome since it never got its due here in the states until now. So if you’re a fan of these types of movies, this one is going to be a must-see for you – plagiarism be damned.